Many consumers have fallen into the habit of being an impulsive buyer. We often purchase many items on a whim! It’s seems like a natural reflex and may appear harmless at the time, but the long term effects will be visible in the future! Try researching the item before you buy it and searching various sites for the best deal. Often we buy an item and see it on sale the very next day! Compare brands to look at similar styles. 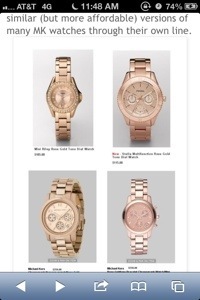 An example of this is Michael Kors watches and fossil Watches. They are made by the same company and look very similar! You will be surprised at how much money you save while still being PERFECTLY FASHIONABLE!! Tell me about your experiences! Have you ever over payed?